Well, it’s the day before surgery, and I feel like pregnant women must feel before they have babies. I feel the need to nest and do domestic things, so what am I doing? Making soup. Doing laundry. You know, domestic things. I’m cooking soup for myself because I don’t want store-bought soup full of salt, sugar and other things that I prefer not to eat. I mean, have you looked at the label on a can of Campbell’s cream of chicken soup? Scary! My post-op eating plan includes soups that can pass through a strainer, and includes such things as thinned cream of chicken or cream of mushroom soup. Not being a fan of cream of mushroom soup, I elected to make my own homemade version of cream of chicken soup that omits the flour as a thickening agent. I also decided to make French onion soup, because by its nature the broth is thin and flavorful. So I bought a roast, which my husband will be eating off of all week long, and am roasting it with veggies and aromatics to generate some stock that I’ll add to a crockpot with caramelized onions to make the soup. When it’s time for soup, I’ll just pour it through a strainer to catch the onions and sip on the broth. Easy enough, right? Good soup starts with a good, rich stock. On the left: the stock for the cream of chicken soup. On the right: the roast that will generate the stock for the French Onion soup I’ll be finishing off in the crock pot. 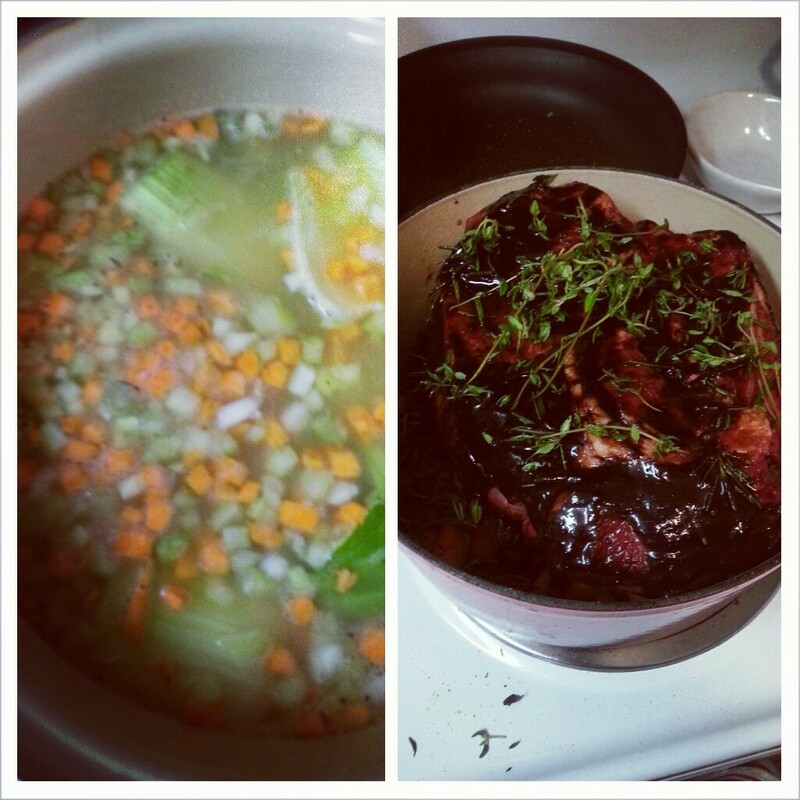 Enough about soup making for now. This week’s loss was 3 pounds, which is a slight disappointment, but not a surprise. I mean, I lost nearly 22 pounds in the two weeks prior, so I am not surprised that this week’s loss was smaller. This is how it seems to go with my body–at first I’ll drop a tremendous amount of weight, and then it slows to a trickle. This has been the pattern for as long as I can remember in every attempt I’ve ever made to lose weight. I don’t expect that to change too much post-surgery either. But I could be wrong, and I hope that I am. The house is stocked with plenty of Isopure Icy Orange, orange-flavored Powerade Zero, cranberry juice that I can dilute with water. I have comfortable empire waist dresses and nightgowns I can wear to keep pressure off the incision that will be above my belly button. I’ve got plenty of pillows to prop me up in bed with since I won’t be able to sleep on my left side at first. I’ve got my insulated tumblers clean and ready to fill up with water or Isopure kept cold. I’ve got a gallon jar of hibiscus tea brewed, and after this evening, I’ll have some soup to eat. My house is ready. Am I ready? Yes, except for the last few things I must do before bed. The alarm is set, the scopolamine patch I have to wear is ready for me to put on before I go to sleep, and I’ve got the Hibiclens ready to shower with in the morning. Tomorrow morning at 7:30, I check in to the hospital, pay them what I owe them, and then it’s showtime. The next time I post, I’ll be back home and sip, sip, sipping and walk, walk, walking. The next time I post, I’ll finally have a fighting chance at uncovering the me I’ve never seen. And it will be an awesome ride. 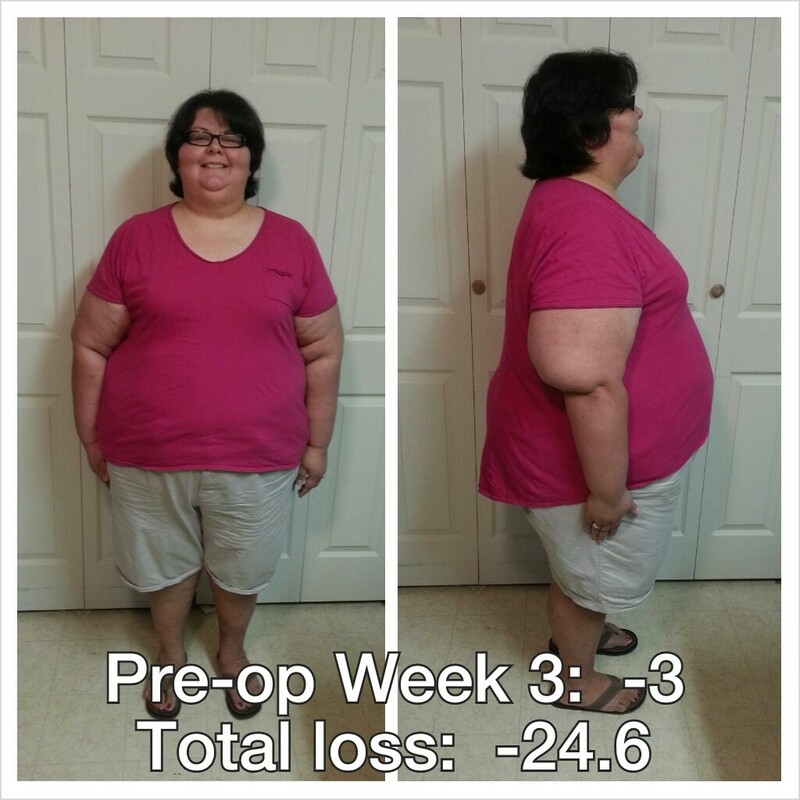 This entry was posted in pre-op, progreso, weight loss surgery and tagged photo post, post-op eating, pre-op, preparations, progress report, sleeve gastrectomy, soup, VSG, WLS. Bookmark the permalink. I had pics, but I don’t know what happened to them…I think they were on a website that no longer exists. You know I’m vibing away for ya!! That’s the plan…take one last set of pictures of me, pre-surgery. I wanted to have some professional ones taken but ran out of time and money to do it. No worries, I’ll have it done 6 months from now, and then when I get to goal. I know this is an old post … But it’s still really helpful to me! My surgery date is May 6 and I’m sure I’ll read this several times between now and then. Not too far off! Glad this is helpful for you.